When all things are counted, the distance wasn't meaningful. I'd run 20km in a single go back in 2014, during rehabilitation in the year I broke my knee, and had ran 23km on one of my Titirangi loops over a month before. But in terms of the challenges overcome, as well as just sheer delight of running in an event, my first half-marathon was well worth the effort and I'm glad I entered. It had started to form as a goal last year. I'd nurtured a brief hope of taking part in the Guangzhou marathon, but as soon as I'd started running, I did something to my heel that eventually became tendonitis and that led to 4 months of inactivity. It was only in New Zealand with the wonders of physiotherapy that I had a plan, with more running-based rehab, and the show got back on the road. 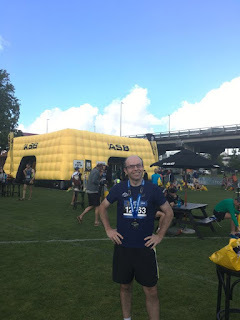 Always one for the big goals, I'd considered going big and doing the full marathon but sanity did what it proverbially should and I entered the Auckland half-marathon. And it pretty much all went wrong from that point. I'd been running with the well-worn shoes I'd used in China. They were worn so for the first new pair in New Zealand, I went back to my favourite brand of the past, Brooks. They're tough shoes for people like me with flat feet. I also got a new pair of in-soles and refurbished my old ones. And immediately I felt problems on my longer runs. At first it started as a sensation around the outer hinge of my knee joint, that tightened over the front and then went down the back of my calf, and it would be at that point that I'd have to stop. At first it only kicked in after 18 kilometres, but with each run it started earlier and earlier. My podiatrist looked over the insoles and couldn't find any reason for them to cause it but must have had an inkling as she mentioned "I'd like to see you in a more neutral shoe." I'd just spent a lot of money on a pair of shoes that had been so reliable in the past but they were "support shoes" not neutral shoes. Our trip to China and the UK was upon us so I kept with my Brooks. Over in England, I tried to run along the Baskingstoke canal twice but each time I quite quickly developed the pain again, even when I changed in-soles and tried different things but I could barely make 10 kilometres anymore. But the inkling that my podiatrist had got me into action as soon as I came back: I bit the bullent and bought some "neutral shoes", New Balance, and the podiatrist approved of them straight away. After a few days of breaking in I ran 5 kilometres without pain and prematurely announced that I'd been cured. If I had been cured, my booking for a physio the next morning would have been superfluous. But I went anyway and she checked me out and gave me some exercises for what she thought was wrong. Three days later reality intruded: I did a weekend run and at the 14th kilometre I felt that familiar sensation once again and stopped on the 15th. I gave it another week to rest and for the effect of the exercises to kick in and had to stop another run after just 4kms. I was beginning to plan to pull out of the run. Two days later and 6 days before the event I gave myself a "make or break" run. I did an extended warm-up this time, for about 20 minutes, and then ran. It felt OK but at the 11th km again, the sensation appeared and I ended it to prevent any damage. Fortunately, I had another trip to the physio and the diagnosis was now clear. I had IT band syndrome. IT standing for iliotibial; your IT band is a ligament that runs down from the hip and over the knee and helps stabilise your leg on uneven ground. The working hypothesis was that my "tough" Brooks weren't letting my foot move naturally and forcing my knee and hips to do all the work aggravating the IT band, which in turn pulled on the knee and hip muscles. Even though I'd changed from the Brooks, the inflammation had never really gone down. So I went hard using a foam roller to massage the area as well as getting the physio and other massage providers to go hard on the area too. I also did exercises that reduce the chance of the syndrome developing. Either way, after I broke on the "Make or break" run, I was still confident enough to give it a try. To continue with the good news / bad news narrative flow, I then got a mild cold four days before the event but that didn't sway me. At my last trip to the physio before the run, she suggested I go for a short run to test things out and I went out on a 3km blast without problems and then did the foam roller afterwards. I used voltaren and ibuprofen to reduce any inflammation and then left everything else till race day. Which came this morning. It was a beautiful morning, too. I ferried over early but the time was perfect to suss out the location, stretch areas and I gave myself a good warm-up. There was a buzz around and runner talk abounding. Then in a mass of people, the start countdown came and we were off... walking because you can't really run till you're through the gate and on your way. The course started in Devonport and then snaked out the back to Narrow Neck beach. There were some manageable slopes and I had quite a good rhythm. Running with people is great because they naturally pace you and you can choose to scamper ahead or fall back. My pace was around 5 minutes per kilometre which was faster than I had done in any practice. There is a peril that the occasion makes you outdo yourself. My goal was to get a time between 1:50 and 2 hours, and conveniently they had pace setters for both of those two times. I passed the 2 hour marker at about the 3 kilometre mark (he'd been through the gates earlier than me), and kept moving up the field. I hoped to eventually sight his 1:50 friend but with a distance between them opening up, it was going to take some time. Everything felt fine until at the 8km mark, that all-to-familiar sensation came to the knee hinge of my right leg. Dread filled me. I thought about stopping: there were still 13 kilometres to go. But I kept running, choosing to run on a slope that wouldn't irritate it as much (but may irritate the other knee). Which brings me to another advantage in these events: proper road running. Suburban running forces you onto the footpaths for safety from cars. But they're made of concrete, which is harder than asphalt, and they vary in angle. Many driveways dip down. The only roads you can run on are side-roads but they tend to be domed without a flat area. This run was on proper asphalt roads and there were always flat areas. I kept running and tried my best to be on the flat or the slope for the other side. Others would jump onto the footpaths but I religiously avoided them. The sensation around my knee remained with me for quite some time haunting me but, to its credit, it never went much further than being a sensation. At one point I saw another runner doing a few strides of side running on each side, and I tried that too and it seemed to make the sensation go away briefly. Hip movement can take the force off the knees too so I tried to run with a bit more of a shake. And eventually I didn't notice the knee much at all. 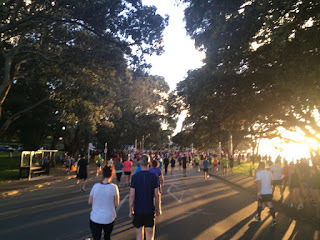 I kept my pace preparing myself for the last third which begins with the biggest attraction of the course: the Auckland Harbour Bridge. It is also hugely daunting. I drove up it last weekend and it did give me a moment to reconsider my participation. It's a long consistent gradient. I'd done training with short sharp gradients (One Tree Hill, Titirangi and the Tiverton slope near Blockhouse Bay) so thought I should still have enough power to do it as long as the first 14km were not too taxing. It was on the early part of the Harbour Bridge that I passed the 1:50 marker. That was a relief - even "hitting the wall" or "something" developing I'd still be at least near him and with the end approaching, I'd almost certainly be able to finish before the 2:00 gent. I grinded my way over the bridge and then down the other side. It was then that I felt my left hamstring twinge. With another 5 kilometres left a "something" had arrived. Fortunately it wasn't a major pain - I felt that even with it I'd be able to slowly and painfully finish the run and get some treatment. And that's what happened. Turning the final corner and seeing the Finish arch was great but I knew I couldn't do an impressive dash to the finish. The clock read 1:52, but taking into account the fact that I didn't get through the Start gate early, the "net time" was 1 hour, 50 minutes and 1 second, just inside the range I aimed for. Contentment! Now it's time to rest and forget about running for a while. I'll continue with exercises and maybe in two weeks I'll get back on the road and see if I'm really up to aiming for a full marathon!